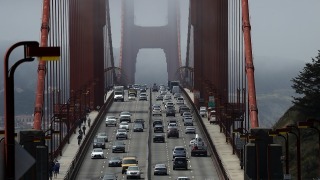 File image of Golden Gate Bridge. Eleven people were hospitalized with minor injuries Wednesday after a Graton Casino bus rear-ended two vehicles — that had stopped after colliding with each other — north of the Golden Gate Bridge toll plaza, according to the California Highway Patrol. The crash, which occurred on southbound Highway 101, was reported around 12:45 p.m. It forced the CHP to close two lanes. A preliminary investigation has revealed that a pickup truck rear-ended another vehicle, which was approaching the toll plaza and came to a stop in the No. 3 lane. The tour bus then crashed into both the cars. Multiple people complained of pain and first-responders from several agencies rushed to the scene, the CHP said. In all, eight bus passengers were taken to hospitals as were three occupants of the two other vehicles, according to the CHP. All lanes of the highway had been cleared by roughly 1:30 p.m.